Greek mythology is full of exciting heroes, treacherous gods, and gross monsters. 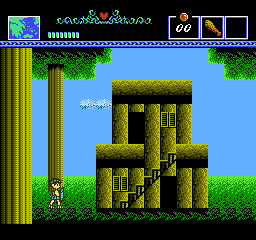 The Battle of Olympus, the first original title from Japanese developer Infinity, mixes up the side-scrolling RPG action of Zelda II: The Adventure of Link with the fertile settings of Greek mythology. Developed as a passion project by the husband and wife team of Yukio Horimoto and Reiko Oshida; the former did the programming, the latter did the graphics. The music was composed by Kazuo Sawa of Kunio-kun fame. 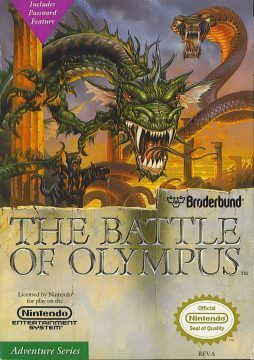 The Battle of Olympus features bright, colorful graphics, an earworm of a score, tight controls and an epic sense of scope. It’s also notable for its controller-snapping difficulty. You play as Orpheus, a man deeply in love with the fair Helene. After Helene is mortally wounded by a serpent, Orpheus is stricken with grief. The goddess Aphrodite comforts him with a revelation: Helene is actually alive, but has been whisked away to Tartarus by the evil god Hades. Armed with little else than a club, Orpheus has to venture to the eight lands of Olympus completing quests in order to reach Tartarus and rescue Helene from Hades. 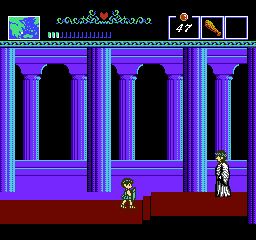 Unlike Zelda II, The Battle of Olympus takes place entirely from a 2D side-scrolling perspective. Although you venture through several locations, you are warped to the appropriate location once you find their entrance. There’s an overworld map, but you don’t directly traverse on it, and locations tend to be more maze-like. By entering in passageways in the background, you get zipped to different locations (think of a better designed take on the mazes from Rambo for the NES). It can be easy to get lost in some of these twisty passageways since the game has no mapping system. Mapping these areas out by hand can be a help, as can having a good FAQ or two by your side. You gain different weapons and special items to collect throughout your adventure. You don’t gain experience levels, but you can earn additional HP through collecting Ambrosia and stronger weapons from beating bosses. Thought you don’t grind for experience points, you’ll grind for currency (olives and salamander skins) to purchase certain vital items for your quest. Although you can’t save your game, you get infinite continues and passwords. The method of getting passwords is a bit of a pain in the neck: you have to schlep all the way to a god’s temple and ask him for the “word of god”. 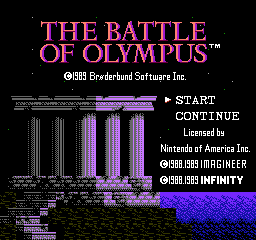 Given the decent length of The Battle of Olympus, this title really should have allowed for players to save their game progress. Combat in this game is quite tough. Early on, your club tends to not have much of a reach. In every battle, you put yourself at risk. It gets easier later on when you get a shield, but your success in this game is paramount on playing more of a defensive game. If you run against the mythological monsters head-on, you’ll get creamed. Although the controls themselves are pretty tight, the volume of enemies can be overwhelming. Early on, you fight tons of purple slimes in the forest. They leap in an arc towards you at a speed that’s just fast enough to throw you off your game. The Battle of Olympus starts off challenging and just gets harder. 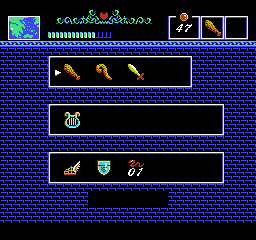 Eventually, you get shields and even worse, flying enemies love to swoop down and knock you into pits. When you continue, you lose half of your olives, effectively throwing hours of grinding down the drain. 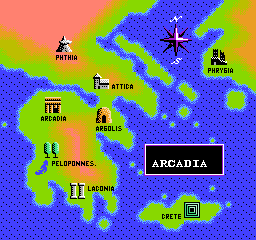 Still, whether it’s the verdant forests of Peloponnes or the run-down ruins of Laconia, there’s a nice variety to the locales. Unlike Zelda II, bosses don’t get their own life bar. They often appear as tougher enemies in the midst of the maze-like levels. They kill you in a few hits and are always dressed to kill. Like most side-scrolling action games, you have to memorize enemy patterns to win. You can cheat a bit against the bosses by forcing their backs to the walls and flailing at them non-stop, but most of these encounters are real nail biters. 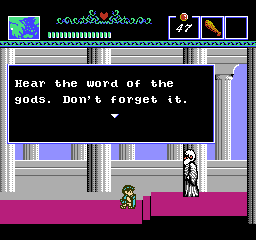 Special note should be made of the final boss fight against Hades. 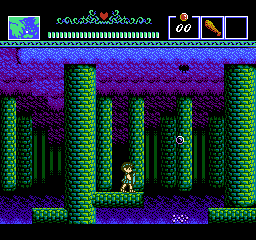 In a clever spin on Zelda II’s boss fight against Dark Link, you enter a stone bridge. A full moon lies ominously in the distance. Hades appears in shadow form upside down below the stone bridge. You have to jump and attack him while judging your attacks on the upside-down shadows of Orpheus and Hades, plus he’s twice your size. After you pummel him enough, Hades’ true human form appears and you fight him just like any other boss. 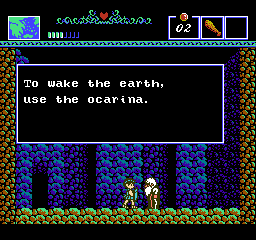 Orpheus’ sprite looks awfully similar to Link in Zelda II. Sure, he’s wearing sandals instead of elfin shoes, but he has the same quick gallop to his steps. Specifically, the sprite of Orpheus when he gets hit is a dead ringer of the Hero of Hyrule. Although the NPCs and enemies look good, it’s the environmental backgrounds that are the star of the show. There’s a gritty, post-apocalyptic quality on display that provides oodles of atmosphere; much of the artwork is as good, if not better, than what Nintendo did for Zelda II. 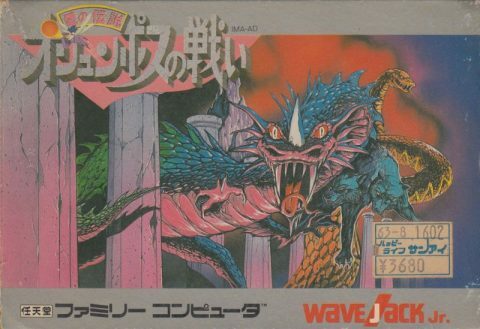 Kazuo Sawa’s score adds to the sense of adventure in The Battle of Olympus. From the melancholy title screen music to the playfully agitating “laughing” theme of Tartarus, Sawa’s mastery of the NES’ music capabilities are on full display here. 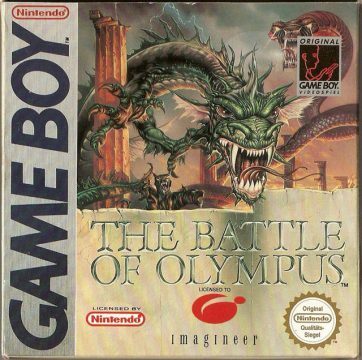 In 1993, Imagineer published a Radical Entertainment port of The Battle of Olympus to the Game Boy. Created for the European market, this is a fine, if straightforward, port. Given the Game Boy’s limited resolution, you get a cropped view compared to what you get on the NES. This is less of a problem than it sounds because the characters tend to be small in this game to begin with. Sawa’s soundtrack as arranged on the Game Boy is lacking the complexities of the original, but the core melodies are still there. It’s a rough haul, but The Battle of Olympus is still one of the better action-RPGs on the NES. 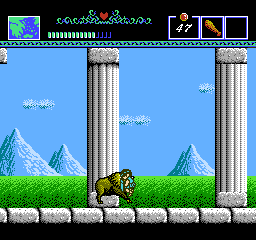 Its Greek theme was a real novelty in the days before God of War and Master of Olympus: Zeus. 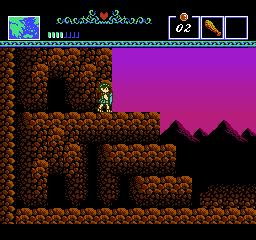 And it’s as close to a Zelda II sequel in gameplay on the NES, for better or for worse.